The health and safety of campers and staff are Gold Arrow Camp’s top priority. We provide counselor supervision, safety equipment, and training to help ensure campers have a safe experience at Gold Arrow Camp. Our staff and program encourages campers to gain independence, learn new skills, and gain confidence while maintaining the structure and supervision necessary for their safety. Gold Arrow Camp utilizes the resources and programs as outlined below to promote the health and safety of everyone in our camp community. Two registered nurses live on-site and are always available to campers and staff for first aid, disbursement of medications, and general care as needed. 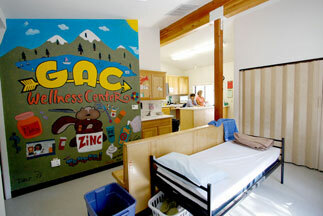 As per the American Camp Association Standards, all medications are stored in and dispersed through the Wellness Center. For illnesses and medical emergencies requiring additional assistance, appropriate EMS procedures are followed. The closest hospital is located approximately 1 1/2 hour from camp, with emergency helicopter transportation available if needed for a faster transport time. A health history and medication card is completed for each camper by the parents prior to camp attendance. All medications and health histories are confidential. All medications (including over-the-counter medications, vitamins, and homeopathic medications) must be stored at our Wellness Center and distributed by our camp nurses. Our nurses can only administer medications that come in their original container and at the dosage prescribed by the doctor. We highly recommend no changes to your child’s routine prescription medication or dosage prior to their camp stay. We also suggest discontinuing vitamins and supplements that are not critical to your child’s health during their camp stay.